On Thursday, 15 February, SADAG paid a visit to Rabasotho Combined School and the team supervised by Anne Rajcoomar, was Phumlani Somacala, Katlego Khoboka, Makopa Molope, Philile Myeza, Nono Maseko and Thuli Ngubeni. The SADAG facilitators presented talks to all students from Grades 6 to 11 and a total of 255 students were addressed. The talks were focused on Depression and Suicide in commemoration of ‘Teen Suicide Week’ which was from 11-18 February 2018. The talks helped the students to identify whether they or their friends have the signs and symptoms of mental illnesses. It also provided them with information on what to do and who to speak to if they feel depressed or suicidal. They also received information on the progression of Depression and risk factors for Suicide. These interactive talks allowed a number of students to approach the counsellors after the sessions, to assist them with their own personal issues. This is indicative of some of the struggles that teens are encountering with and lack the support or resources to deal with these psychosocial challenges. 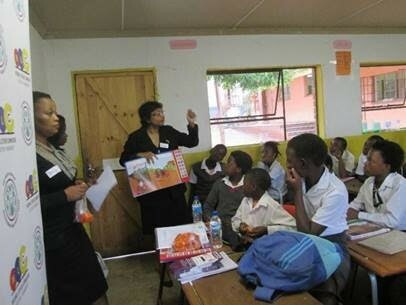 Therefore the talks that SADAG presents at schools are beneficial for students and empowers them with the necessary information to get help or a much-needed referral. Research has shown that the Speaking Books can be used effectively as a communication tool. Children and teens find it easier to focus when a voice is speaking to them and there is less room for being distracted or pre-occupied which can sometimes happen with reading. On top of this, they might even pay more attention to what the voice says when a person is seen as opposed to someone who is trying to teach them about things that they are personally feeling. It is easier to listen to someone when they are possibly helping you to understand what you have not understood about yourself and/or others. The book’s illustrations are very simply done and easy to understand. The voice used in this Speaking Book is that of Lillian Dube, who is a local celebrity and has suffered personally from Depression.